FHA 203k Loans is a acquisition and construction/renovation loan all combined in one loan. This type of loan is where a home buyer can purchase a fixer upper or unhabitable home that is in need of rehab with a 3.5% down payment on the after improved value. However, homeowners cannot do any structural changes and/or modifications to the home. They cannot do any types of room additions with FHA 203k Streamline Mortgages. The second type of FHA 203k Loan is the full FHA 203k Loan. Only owner occupant home buyers can qualify for FHA 203k Loans. How Much Higher Are Mortgage Rates On FHA 203k Loans? 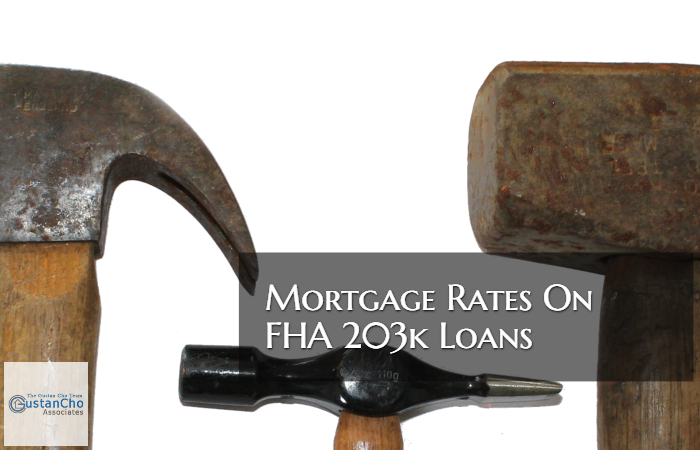 Mortgage rates on FHA 203k Loans are higher than standard FHA Loans. A home buyer or homeowner needing refinance can qualify for a FHA 203k Loan with a 580 credit score and a 3.5% down payment. Home buyers who need a FHA 203k Mortgage Lender with no overlays, please contact us at Gustan Cho Associates at 262-716-8151 or email us at gcho@gustancho.com.